Powder foundations are renowned for being fast and easy to apply, which is great if you leave it to the last minute to get up for work or tend to touch up on the go. They do have their limitations, though. They’re best suited for people with normal skin, as the powder can cling to dry skin and clog up on oily skin. If you are researching new foundation and don’t have normal skin, check out our articles on the best foundations for oily skin and the best foundations for dry skin. You can apply many powders wet or dry to achieve different coverages. The Laura Mercier Smooth Finish Foundation Powder is our top powder foundation thanks to its versatility and easy application. If you’re looking for a matte finish, try the MAC Studio Fix Plus Powder Foundation, while those looking to illuminate their skin should consider bareMinerals Original Foundation for a natural shine. Whether you’re looking for full or medium coverage, this powder foundation from Laura Mercier will ensure you achieve your desired look. Whether you apply it wet or dry, you can expect is to disguise blemishes, hydrate your skin and reduce lines. With users commending the quick application and even cover, we’re pretty sure this foundation won’t fail to impress. With over 52 colours to choose from MAC has ensured that all skin tones are covered. Similarly to the Laura Mercier powder foundation, it also provides a medium to full coverage with a matte finish that should reduce shine. MAC say that the foundation is long wearing but breathable, making it a great all-rounder and with users commending its texture and finish, we’re sure you’ll love it, too. Lightweight but providing effective coverage, Bobbi Brown brings you the best of both worlds with this powder foundation. Thanks to its creamy texture, the foundation doesn’t dry out the skin and blends evenly to cover blemishes, blur enlarged pores and provide a long lasting polished finish. There’s a good range of colours available, so all skin types are catered for and you can also apply the powder with a brush if you’re looking for a soft coverage. If you’re looking for a powder foundation that provides a not too matte, not too shiny finish, this product from Urban Decay could be the one for you. You can apply it wet or dry depending on the kind of coverage you’re after and even with full coverage, Urban Decay promise that the foundation does not look dry or cakey. According to the brand, the foundation is ultra forgiving, blurs fine lines and wrinkles and it does a of great job of evening out your skin tone. With just five ingredients making up the formula, those conscious about what they put on their skin should take a look at one of the forerunners of the powder foundation market. 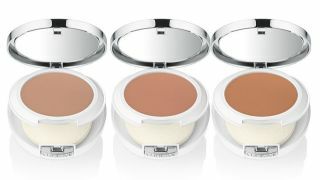 The powder has a soft, creamy texture that when applied, should provide your skin with smooth, even coverage. With makeup artists explaining that it’s ideal for non-foundation wearers, those worried about a cakey coverage should be reassured. You can cut down the time it takes to do your makeup in the morning with this powder foundation from Clinique. As a foundation and concealer all in one, you can ensure imperfections are covered and your skin looks perfected yet natural. Clinique say that this powder foundation is breathable, yet should last all day, even if you’re doing exercise or it’s warm outside. With an RRP of just £11 this foundation powder is a great budget option. It comes in a range of shades so all skin types should be catered for. Whether you use it as a makeup bag staple or a backup for your handbag, this matte foundation should do a great job of reducing unwanted shine. It comes in a compact case and there’s a mirror for easy last minute touch ups on the go.